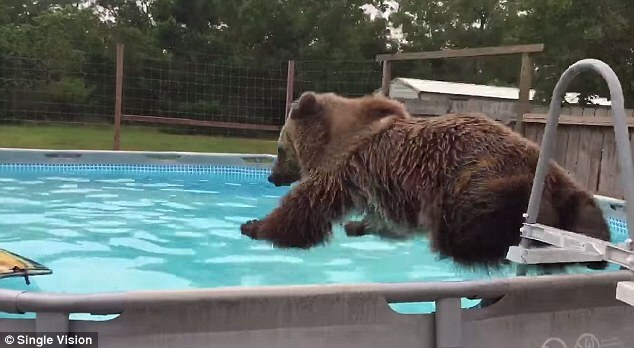 Four-year-old Bruiser the grizzly bear belly flops into a pool to cool off. He is held at Single Vision wildlife sanctuary in Melrose, Florida, where temperatures have hit high 80s and 90s this month. 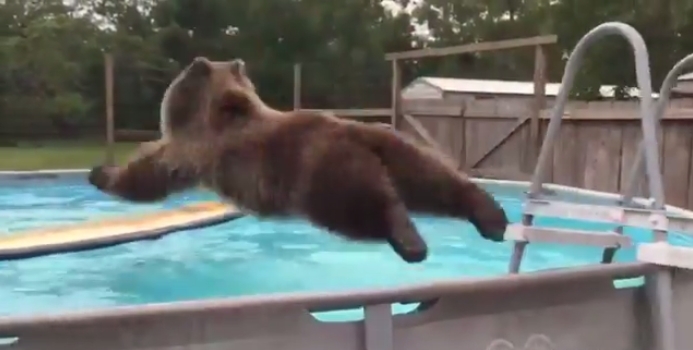 This is the moment a grizzly bear belly flopped into a Florida pool in hopes of cooling off in the summer heat. Four-year-old Bruiser is seen in the video climbing the pool's ladder before jumping horizontally into the water. He takes a moment to shake his wet fur after hitting the water and then is off to play in the water with his toy. The 600lb grizzly is held at the Single Vision wildlife sanctuary in Melrose, Florida, where temperatures have hit high 80s and 90s this month. Bruiser has a surfboard to play with in his pool, as it'd be impractical to have a blow-up swim toy with his massive claws. Single Vision wildlife sanctuary is a nonprofit organization 'dedicated to endangered species education', according to its Facebook page. The sanctuary has several threatened endangered animals on site, including white tigers, Florida panthers and, of course, Bruiser the grizzly. Responses to "Moment 600-Pound Bear Belly Flops Into Swimming Pool"
They are so much fun to watch playing in water but oh does a wet bear smell bad so stay back!